Beijing Century Joyo courier services is a subsidiary of Amazon! According to David Spitz, CEO of Channel Advisor Corp. (a marketplace enabler for Amazon, Walmart, Ebay and other retailers) — products sourced from China will account for the majority of unit volume on Amazon. Also, he states that 20% of Amazon’s sales will be from its own private-label products. Both these points seem to lend case to the greater need for a robust supply chain to help enable these drivers of growth. As part of a secret project apparently named as “Dragon Boat” and appropriately so given its focus on China, Amazon has unleashed an interesting game plan to start dominating on the logistics side. Incidentally, Amazon’s new hire focus in their Global Sourcing teams is oriented towards recruits joining their Supply Chain Optimization Technologies (SCOT) team — https://www.youtube.com/watch?v=ncwsr1Of6Cw&feature=youtu.bewhere there is a race to build next generation inventory planning platforms and other capabilities. Amazon is trying to reduce the cost of its Fulfillment by Amazon (FBA) services given that the majority of its products originate from China. Amazon has also begun establishing shipping routes from China to North America, UK and Japan. Amazon logistics intends to create a one-stop E2E ocean freight service to its marketplace sellers. Such initiatives are also targeting the growing cross-border e-commerce trade, which is about 15% of total global e-commerce volumes. Alibaba, not to be left behind in this race, is investing $16 billion in supply chain initiatives for its Cainiao subsidiary. Cainiao started in 2013 largely to support shipments from China. It has now expanded to 224 countries and regions. Cainiao provides a data-driven logistics platform to about 90 Chinese and international logistics companies. This is however focused on the package delivery for its larger Taobao and T-mall retail operations. Amazon is also promising to deliver small items from China in five days for its prime members. While these initiatives are working towards the shipment of its parcel products across the globe, the sourcing of import/export products also benefits from the infrastructure advantages being built as part of these global services. Alibaba.com has a separate division Alibaba logistics that determines the shipping needs of importers and provides freight options that the suppliers can then support. Alibaba logistics has built out partnerships with UPS and Fedex for express delivery. They have partnered with Maersk for container shipments and DHL and Kuehne+Nagel for airfreight. In 2016, Alibaba enabled suppliers to reserve space on Maersk container ships through its OneTouch service. 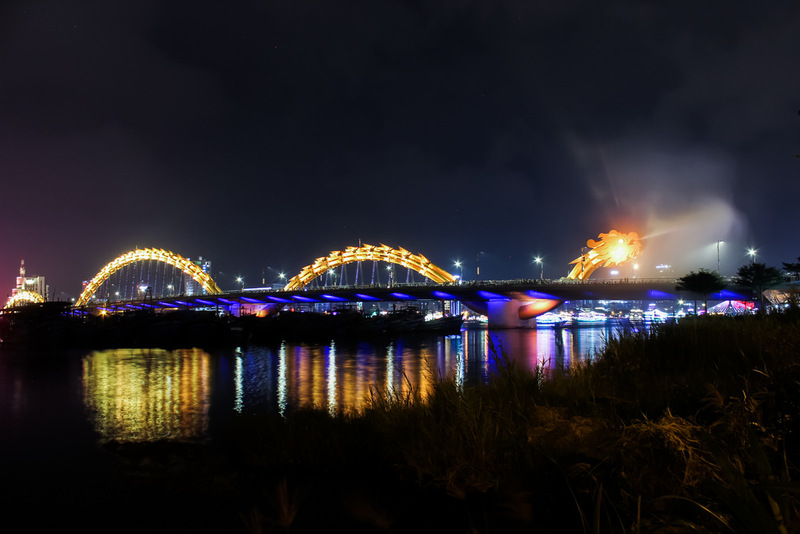 This service offers online booking on select routes between 5 Chinese ports and 8 international destination ports. In early 2017, Alibaba announced a cooperation agreement to integrate members of the world’s largest logistics network, WCA Ltd., with the Alibaba platform. In order to continue serving even small and medium enterprises, Alibaba has partnered with more than 100 logistics companies and 1700 freight forwarders. Walmart.com roughly had about 2 million items up until 2013 as it revamped its marketplace program. When the marketplace program was accelerated in 2015, there was more than a 200% growth YOY in the number of items offered as more sellers were on-boarded through a seamless portal. As the mechanisms to get more sellers got better, the opportunity to offer more products to the customer increased. This is still way behind the 360 million items that Amazon offers with more than 90% of that mix coming from the roughly 2 million marketplace sellers on its platform. 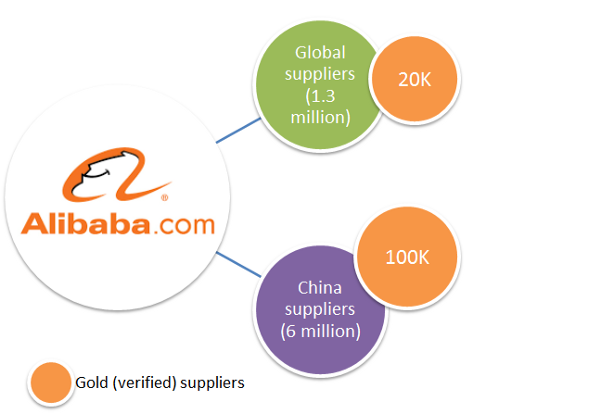 Alibaba.com through its sourcing platform offering has increased its supplier base massively (although heavily skewed towards Chinese suppliers) and is continuing to offer a suite of services addressing the convenience and trust needs of its stakeholders. It has several challenges to deal with especially with many suppliers being traders or middlemen and the ability to deliver quality products is heavily dependent on the buyer’s importing knowledge and skills. Nevertheless, the platform ecosystem is in place and Alibaba is working hard to remove the outlying challenges in this complicated business. Building a broader supplier network however helps with the ability to not only add more products exponentially, but also reduce costs across the supply chain through the consolidation of demand and supply. According to the Hackett Group, procurement organizations who work with a diverse supplier base had lower overall operating costs and spent 20% less on their buying operations. There is a cost associated with providing the trust and convenience benefits through a robust platform. This is however optimized when suppliers and retail buyers come together for repeated transactions based on realized benefits that they see. It is an unavoidable reality that trading is becoming more and more global and it is necessary to ship products at lower costs to build a sustainable business. 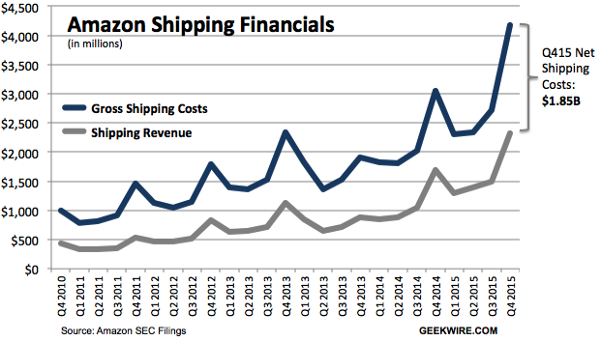 Amazon’s shipping costs in 2015 exceeded $5 Billion. This includes the entire domestic as well as international shipping costs that the company incurred. From a shipping standpoint, they had a net loss of $1.85 Billion. This continuous surge in their shipping costs has prompted Amazon to invest aggressively and experiment in a host of capabilities. It is important to note that while all these investments are geared towards reducing costs to the company, however, these can be interpreted as a suite of services geared to build trust and convenience to continue creating stickiness and attract more buyers and sellers under its fold. While the initial and ongoing investments to make this happen are heavy and prone to risks of failure, the benefits are equally high if the layers of costs are peeled off and optimized in the supply chain. The supply chain space is ripe for a massive digital disruption. Alibaba and Amazon are leading the way in this space and many players in this industry will become not only a beneficiary but a critical part of it. The question is whether you as a retailer, supplier, freight forwarder, shipper etc. are willing to be dominated by these two nimble global players?